We Vancouverites are a demanding lot. We have the pleasure of living in what is (arguably) amongst the least harsh of Canadian climates and yet, the weather is a constant source of dismay. I find it funny. As a transplanted Albertan, I am quite appreciative of the fact that I can enjoy the outdoors year round. Sure we have to endure some rain, but a little rain (and sometimes even a lot of rain) is a heckuva lot more pleasant than six months of snow. Hell, we are such lightweights when it comes to weather that people in the lower mainland think a "snow day" is justified at half a centimeter! So I was totally amused this morning with a conversation between two guys at my office who were lamenting about the awful weather on their Saturday ride. When asked if they were geared up properly, they looked perplexed. I repeated the question - were you dressed for the weather? Did you have rain jackets and booties? No, they did not. We hardly live in an geography of extremes. It gets rainy, but rarely snows. It gets warm, but is rarely scorching. I would totally understand the complaining if we lived in heat ravaged desert or in permafrost. But seriously guys, we live in Vancouver. It was probably 8 degrees with a little rain. So you got wet. My guess is that you probably dried out. Oh, and there is this really fantastic stuff called "Gore-Tex". Check it out sometime. I'm not saying that it is pleasant to be stuck in nasty weather. In fact, just a couple weeks ago, I was caught in a torrential downpour while riding on the Sea to Sky. Although that ride was definitely hypothermia inducing and was not something I would want to repeat on a daily or weekly basis, the truth is that we really don't have it all that bad. 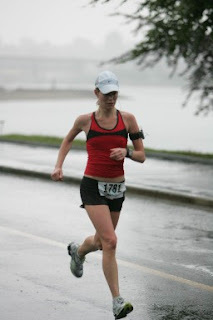 There is a solace and peacefulness about riding or running in the rain that I just cannot explain. It reminds you that you are alive, and that you have the ability to move. Of course, when you stop moving it gets cold but it teaches you to just keep moving. Usually I find that repeating this is enough to get me out in rain, wind, whatever the weather. Hell, if I waited for perfect weather, I would be hard pressed to do most of my workouts! Scotia Half 2007 in a deluge. Lucky for me, I am waterproof. I have also realized that as challenging it can be to motivate myself to get going in suboptimal weather, it is rare workout that I am not glad I have done once I am into it. More often than not, I find that there is an unspoken joy to be found in those rainy day experiences. The childish delight of stomping through muddy, wet trails. The solace of being the only person on the seawall in the rain. Watching the mountains meet the mist. Laughing at how ridiculous it is to ride sideways in the wind. You learn to buck up and get it done, and I believe, you learn a little about yourself in the process!